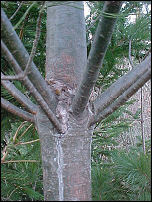 The rich vascular tissue in the live portion of trunks and branches lies under the bark. 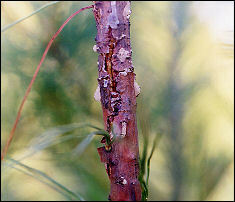 Cellulose-rich wood lies inside the vascular tissue. 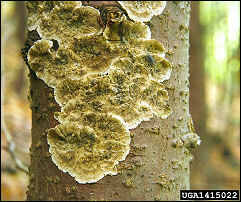 These tissues are the target of a large number of pathogens and wood-rotting fungi. 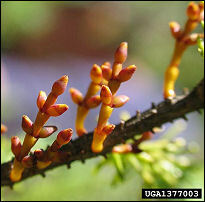 Symptoms are commonly the wilting of leaves or fruiting bodies (e.g. conks) outside the bark. 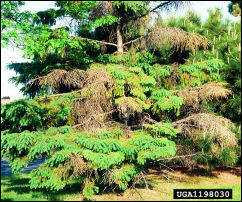 Some are relatively harmless to the trees, while others are fatal. Many diseases degrade wood quality and result in the loss of billions of dollars of monetary value each year. 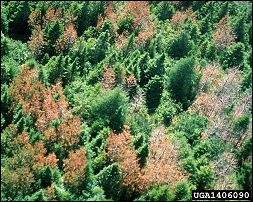 Disease is, by far, the top cause of tree mortality. 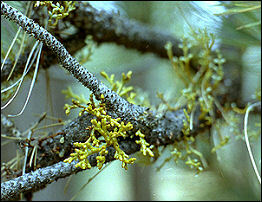 Biologically, many of these diseases are interesting and are an essential component of a healthy forest ecosystem. 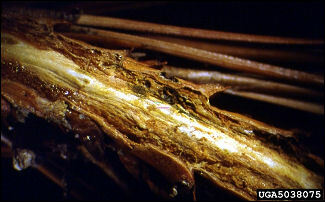 Wood rotting fungi provide habitat for a large number of insects, birds, mammals, and other wildlife. Some are even edible. 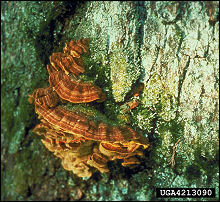 On the other hand, certain exotic species have wreaked havoc on our eastern forests, and there are more to come. Red text indicates an exotic pest.